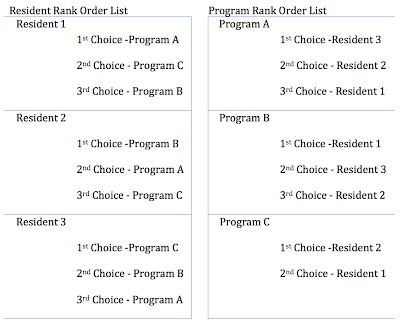 Start off by proposing a Resident to her top-ranked program based on her rank order list (ROL). The program accepts the proposal if it has an open spot, retaining the right to reject it later in the algorithm if a better suitor arrives. 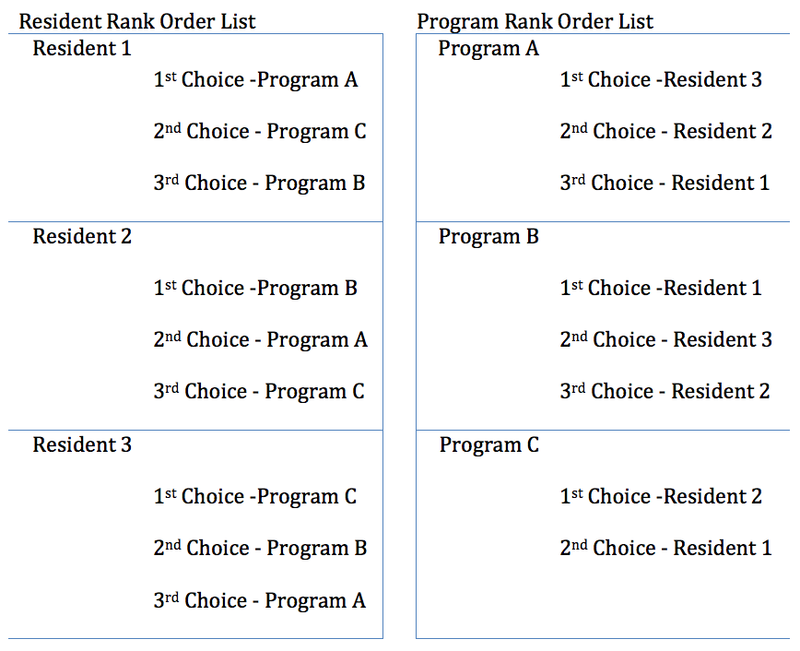 If the proposal is rejected, propose the Resident to the next program on her list. If the proposal is accepted, repeat the process for the next Resident B. There is some more complexity in the system (mainly from couples matching), but this is basically what the Matching algorithm does in several milliseconds. 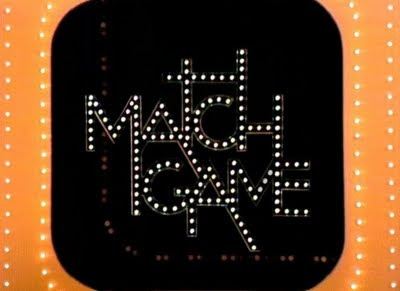 So, lets play the matching game. Can you get all of the questions right? What is the final match result? Somewhat similar to example 3. 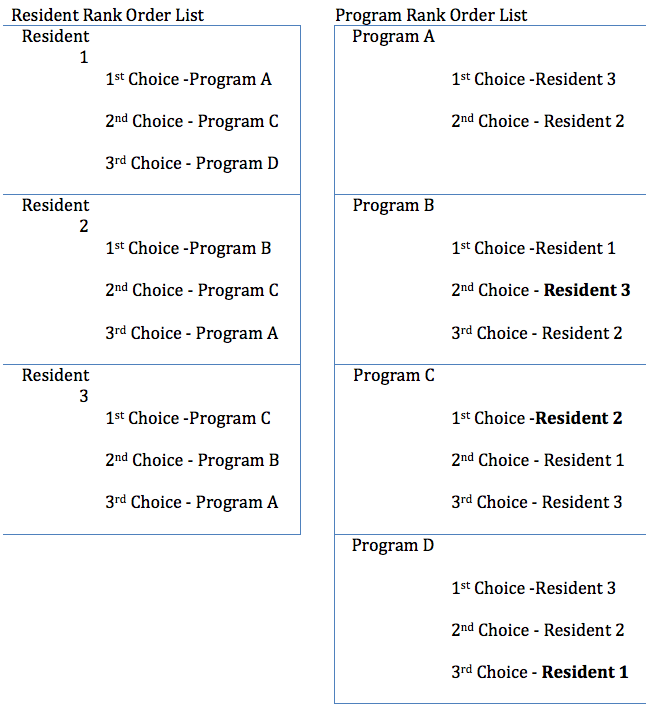 Three residents, three programs, Resident 3 really would like A, but feels she has a better chance of getting into C. So, Resident 3 ranks C higher than A, going against the true preference strategy. Learning point: If Resident 3 would have stuck to her true preferences, she would have been accepted by A. 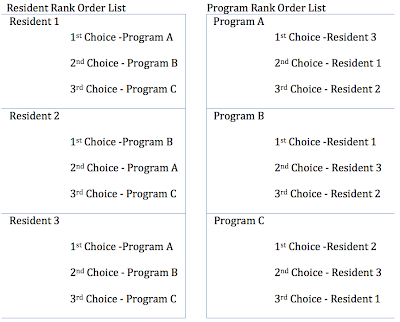 Residents should always order their rank list based ONLY on their own preferences. 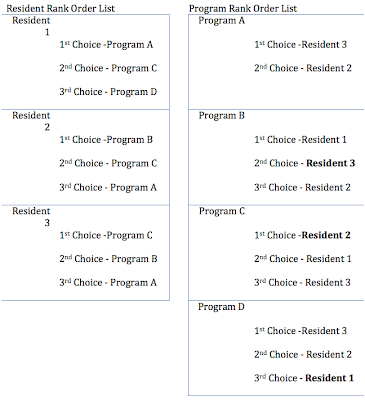 Three residents, three programs, program C really doesn't want to take Resident 3, but decides to rank her anyway just in case. Learning Point: If the stars align perfectly, there is a very small benefit of a truncated list for programs (in real life, this happens very rarely). However, programs don't have enough information prior to submitting their match results to take advantage of this in a systematic way. This though is never true for residents - it is always best to put your true preferences in as your rank order lists. Three residents, four programs (getting a little closer to geriatrics now). 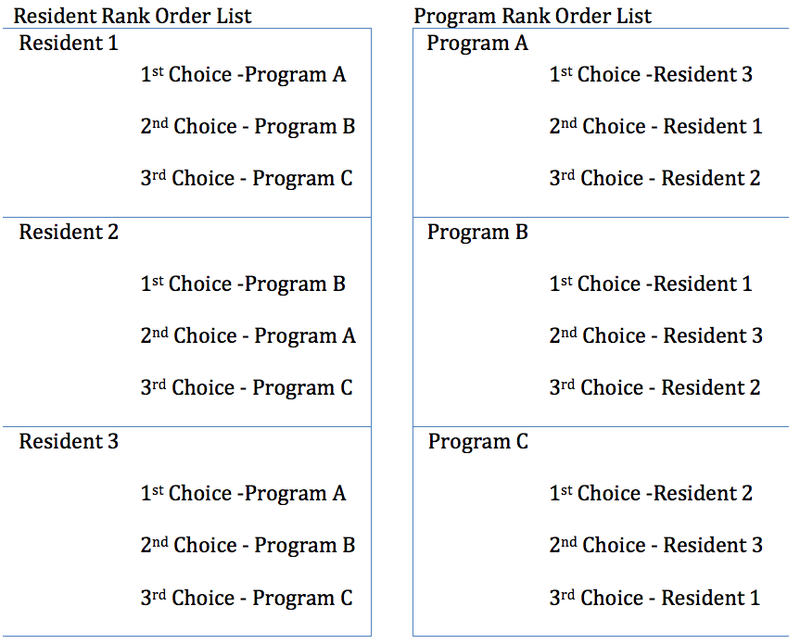 However, Program A likes Resident 1 but would like to truncate their list for the very, very small chance of getting better results (see example 5). They decide to remove Resident 1 from their rank. 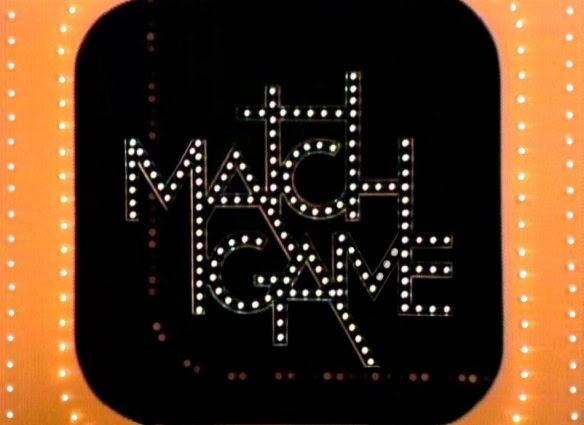 Learning Point: If program A listed Resident 1, they would have matched together. 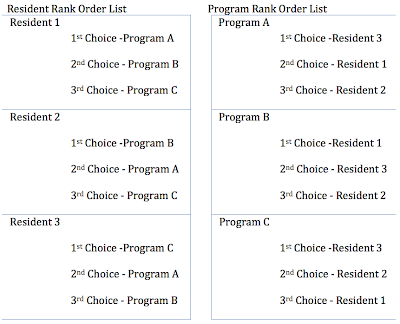 Truncated Rank Order Lists for programs (not for applicants) may slightly improve final assignments but also significantly increases chance of not matching, and the only way to guess right is know exactly what everyone else is putting in as their rank order lists. 5 residents leave UCSF for the match traveling at 20mph. There is a headwind of 5mph. How long does it take them to reach Mt Sinai Medical Center (aka UCSF East)? 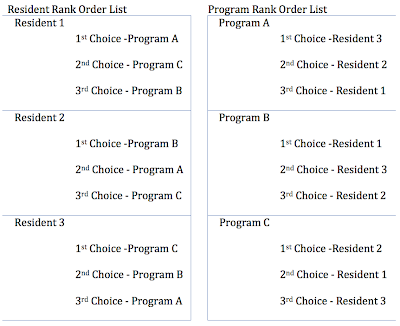 Eric has done a great job of emphasizing an important point in the development of the fellowship rank-order list. 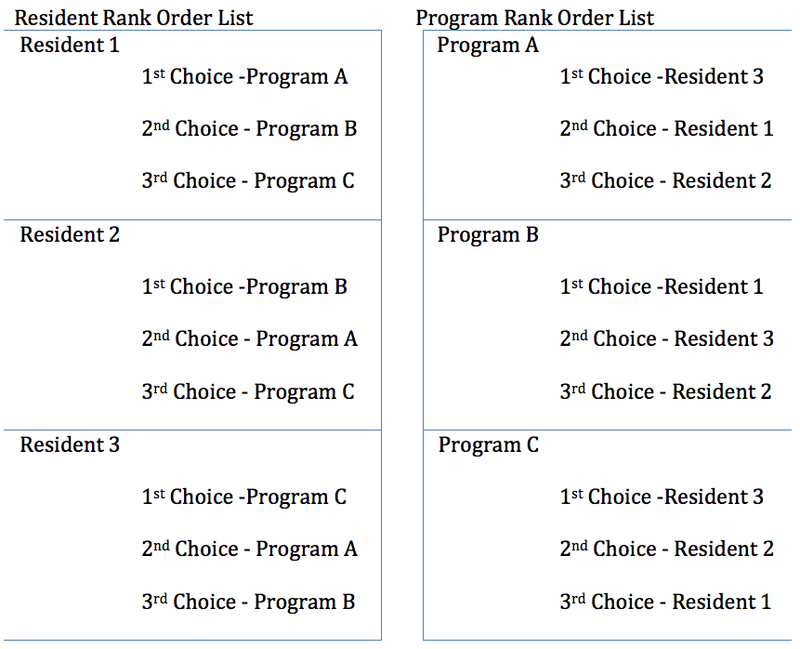 I have had numerous conversations over the years about this with residents, and I've found that trainees can be tempted to rank based on interest expressed by programs. It's always best, as Eric has indicated above, to rank programs based on your interest. 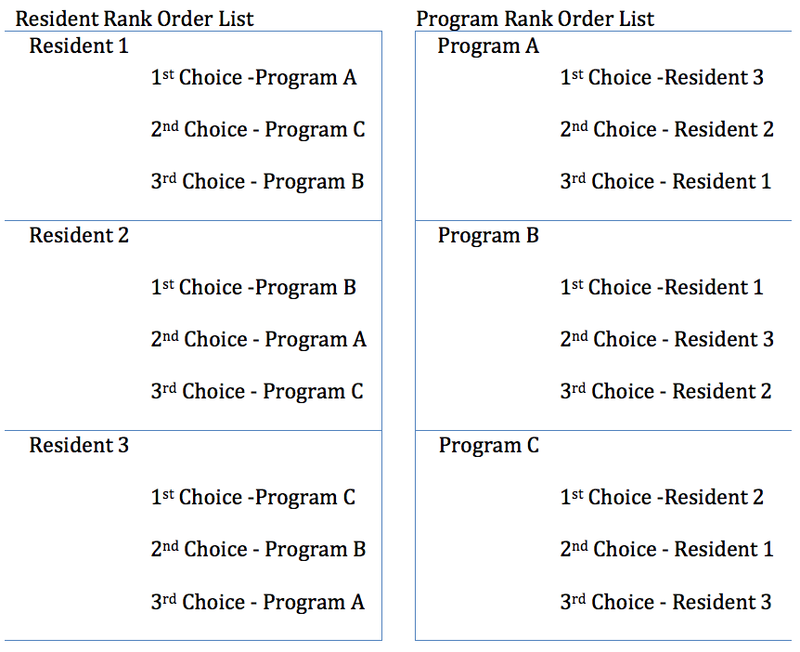 It's sad for me to see applicants go unmatched because they truncated their rank-order list based on interest expressed by programs. This unfortunate scenario can be avoided if you rank all programs you would be willing to attend in order of desirability to you.